The Gate’s thirty-fifth birthday gift to themselves is a set of three plays, set to the theme of ‘Who Does She Think She Is?’. The first, Adam Rapp’s The Edge of Our Bodies, is an unrhythmic joyride of plot and aesthetic. Bernadette is sixteen and fleeing from the New York suburbs, on route to tell her boyfriend she’s pregnant. She’s hauling into NY on a train to feel the senses of the city – and there she is on stage-left, sitting on a stool, reading from a diary. Or is it? We’re never quite sure who we’re watching on stage throughout this 75 minutes of surrealist theatre slash teen monologue, as we ebb from scenes of Bernadette rehearsing her school play to inward diary-led monologues and removals of the fourth wall. Narrator, Bernadette or (probably) a blur between the two – Rapp’s text never unravels enough to be clear. But what is clear is the astonishing work of Shannon Tarbet as Bernadette, in what is essentially a one-act thrill ride from real to made up and back again. She unearths plastic plants from the ground of a would-be rehearsal room and throws them at ornate mirrors that look borrowed from Tim Burton’s Alice in Wonderland set whilst acting lines from her school play, all the while constantly reading from ‘her’ diary: the thrilling tales of a teenager, gripped by growth. She meets a 34-year-old. He’s probably lying and is older than that, and their sexual encounter is, like everything, only textual, but these dramatic moments in Bernadette’s trip (real or psychedelic, you choose) make for effective relapse viewing. As thrilling as it all is, the tension between the play’s surrealist tantrums and its social realist tendencies often causes The Edge of Our Bodies to get lost. 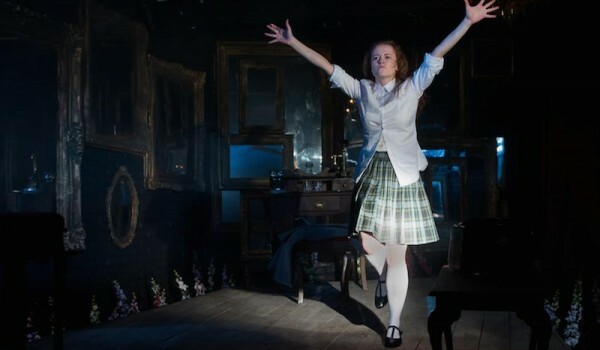 It’s at times a dramatic study of a girl; at others a metaphor for something far larger, leaving whatever it is Rapp is actually punching at diluted by odd – but fun – stage play. And fun it is, but by the end, our perhaps protagonist’s lavish anxiety accounts become lost in what is essentially a pretty and well-acted performance more for performance’s sake than anything else. Occasionally too pretty for its own good, The Edge of Our Bodies‘ blurred motives leave the play hard to engage with by its end, but hey, there’s worse things to be called than pretty. Right?